This dish is better than anything your making. No really, it is. For the simple reason that it has bacon in it. Is there a more perfect food than bacon? If the ancient Greeks had bacon, bacon would’ve been served instead of ambrosia on Mount Olympus; Plato would’ve contemplated the Form of Bacon instead of the Form of Beauty; statues of bacon would’ve been made instead of athletes. Is there something that bacon doesn’t make better? Well, I’m pretty sure there is (I can’t imagine bacon works particularly well in sweet foods). So, enough bacon hyperbole. It’s not the solution to the world’s problems. But it is quite good. We actually get a pretty good bacon from our local butcher shop (I appreciate buying bacon in small quantities because, while it’s good, I don’t use it all that often). I have no idea where they buy it from but otherwise the Niman Ranch bacon sold at Trader Joe’s quite good (and don’t get me started on their ham). The first time I made this dish it instantly became comfort food for me. I don’t know how or why, but there it is. There’s some quality to it that brings me solace. I’m betting it’s the bacon. This dish comes from Gourmet originally. Their version is available on Epicurious. The recipe is pretty quick (it takes slightly longer than it takes the rice to cook) and pretty easy. It also makes wonderful leftovers (I actually made this on Tuesday night and have been eating the rest of at lunch and telling my coworkers “My lunch is better than yours because it has bacon”). Sadly, we didn’t have any scallions so I had to leave them out (there’s a slight taste difference and, more noticeably, the colors different). While I haven’t done it, this dish seems like it would be tailor made for some modifications. Replace the bacon with ham maybe. Or even sausage. But why would you want to do that? Maybe there’s a worldwide bacon shortage; I need to remember to buy pork belly futures then. Bring the water to a boil in a sauce pan over high heat. Add the rice, cover, reduce the heat to low and cook for 20 minutes. In a bowl, whisk together the eggs, 1/2 tsp salt, and 1/4 tsp pepper. In a large (no, not that one, the bigger one; you’ll need it) non-stick skillet, cook the bacon over medium heat until crisp, about 6 minutes. Pour the bacon into a bowl through a strainer. Reserve both. 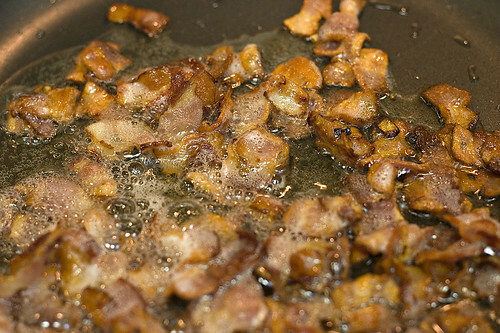 Return 3 tbsp bacon fat to the skillet, turn heat to medium, and add the onions. Cook until softened about 5 minutes. Add the eggs and cook, stirring constantly, until just about set, about 1 minute. Make a well in the center, and add 2 tbsp bacon fat and the vegetable oil. 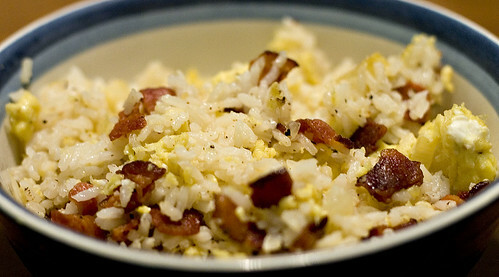 Add the rice, remaining salt (1 tsp), and remaining pepper (1/4 tsp) and cook while stirring about 2 minutes. Add the bacon, scallions, and sesame oil, stir, and cook for 1 minute to heat thoroughly. Actually, as regards bacon in sweet foods, bacon and chocolate are the new hot combo this year. Everyone seems to be doing it, from caterers to Vosges chocolatier. So even sweet isn’t out of bounds. Oh and your recipe for the fried rice is a godsend.. it’s close to the one my mom made when I was a kid, except hers had peas.